The NEW EV1220 heavy-duty inground vehicle lifts are ideal for starting or expanding your commercial fleet service capabilities. Heavy-Duty Inground Vehicle Lifts require less shop space than surface mounted lifts, maximizing the number of service bays. 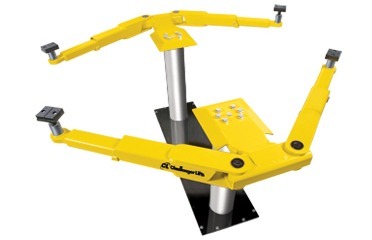 The EV1220 inground vehicle lifts are equipped with standard, medium and high extension stack adapters to accommodate a wide variety of Heavy-Duty vehicle lift points. Challenger Heavy-Duty Inground Vehicle Lifts are fully contained in a recycled polymer housing to protect your investment and the environment. With over 50% more bearing contact surface than competitor’s vehicle lifts, enhanced wipers both top and bottom and NEW larger 8-1/2” chrome pistons, your shop will have a superior, more stable and repeatable lift resulting in increased productivity.